Workshops for corporate wellness and professional development are offered to organizations, educational institutions, and businesses. Writing for Wellbeing believes that when employees feel good about themselves and experience emotional wellness, it naturally follows that they work more efficiently and with enhanced focus. Increased mindfulness generates greater self-confidence in solving problems and in proactively welcoming change and development. Choose the length of workshop to suit you, ranging from 45 minutes to 3 hours (half day). Writing for Wellbeing is an innovative way to generate an attitude of positivity in the workplace. It enhances feelings of motivation and wellness, as well as promoting ease in writing skills and creative thinking. The workshops work brilliantly as part of professional development plans and corporate team-building exercises. 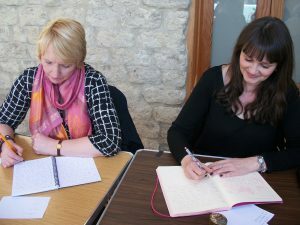 As participative and interactive workshops, Writing for Wellbeing provides a lively alternative to talk-based sessions, while at the same time allowing participants to tap their own inner resources and abilities. Feedback from participants shows that they find the activities inspiring, freeing, and helpful in content and approach – while still being easy and comfortable to do. If you wish to create and sustain employee wellbeing – and encourage motivation for growth – Writing for Wellbeing is what you need.